I’m a man of many pet peeves, but a greasy controller just may be top of my list. Nobody comes near my controllers while eating pizza or chips. If you want to pull that nonsense, you can bring your own damn controller. Well, my ship has finally come in, as the fine folks at Xbox Australia have created a limited-edition Xbox PUBG greaseproof controller just for weirdos like me! The controller is certainly a clever way to celebrate the release of PUBG 1.0 on Xbox One – the game’s all about the Chicken Dinners, after all, which are just about the greasiest thing you can eat. You can check out a (really disgusting) trailer for the PUBG greaseproof controller, below. Carrying the PlayerUnknown’s Battlegrounds signature color scheme and designed with winning in mind, the award-winning Xbox wireless controllers that fans know and love has been applied with a patented special coating resistant to grease and oil. The hand sprayed urethane coating is impervious to minor scratches, water, and of course – roast chicken grease. To finish, each unit is stamped with the PUBG logo and its unique number. As others have pointed out, the greaseproof coating ironically makes the controller look super greasy. That catch-22 aside, I very much want this controller – sadly Microsoft is only producing 200 of them. Hopefully they eventually make it a standard thing. 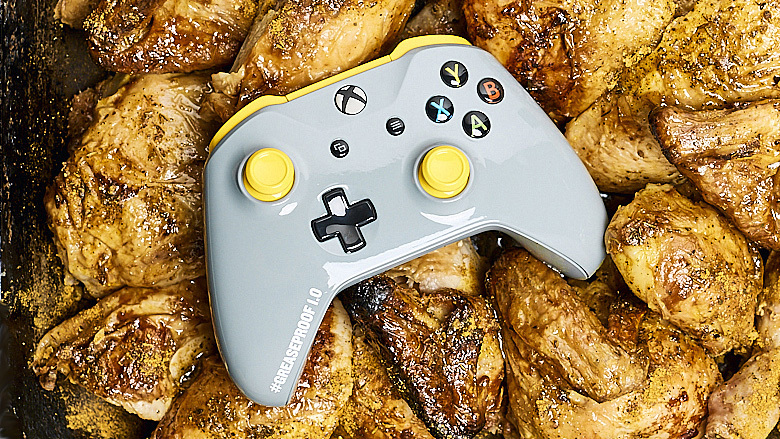 If you’d like get your grubby little fingers on a greaseproof controller, head over to Xbox AZN Facebook page, and leave your best “Winner Winner Chicken Dinner” story for a chance to win one of five controllers. If you don’t nab one, don’t worry, I have a feeling more giveaways will happen in the future. PUBG 1.0 is available on Xbox One as of today.